On Monday, December 9, the Deputy Head of Mission at the Australian Embassy, James McGarry, visited the HSI campus and shared some of his thoughts on Australia’s relationship with Israel and his life in Israel since joining the embassy staff in July with Australian schools, BJE and Emanuel, who are currently on campus. McGarry was previously posted as a Political Adviser to Australia’s Provincial Reconstruction Team in Uruzgan province, Afghanistan (2012-13), and was Third (later Second) Secretary at the Australian High Commission in Islamabad, Pakistan, from 2007-2010. BJE students, Morgan Baynash and Ben Akres, also interviwed McGarry at the AMHSI radio station. James McGarry speaking to BJE and Emanuel students on campus. McGarry spoke about his decision to enter the Australian foreign service, which was born out of his desire to travel and work in politics. He talked about how wonderful it is to be able to work in a country that has both an exciting policitcal scene as well as a multitude of cultural and social actiivities. 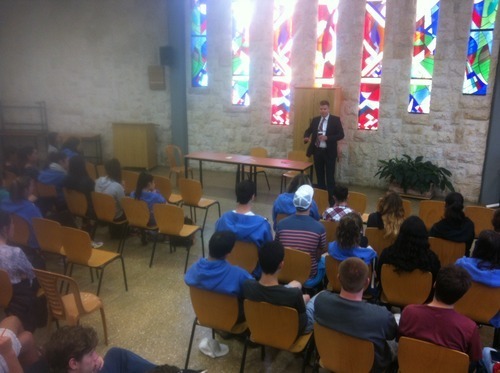 He also shared how interesting Israel’s population is with its diverse mix of people. He believes that this is something that Israel shares with Australia as it also has a population composed of many different groups and could be a point of collaboration between the two countries.